According to annual statistics released by the American society of plastic surgeons (ASPS) amongst the 14.2 million cosmetic minimally-invasive procedures performed in 2015, Anti-wrinkle injections topped the list with 6.7 million procedures performed in the United States alone. 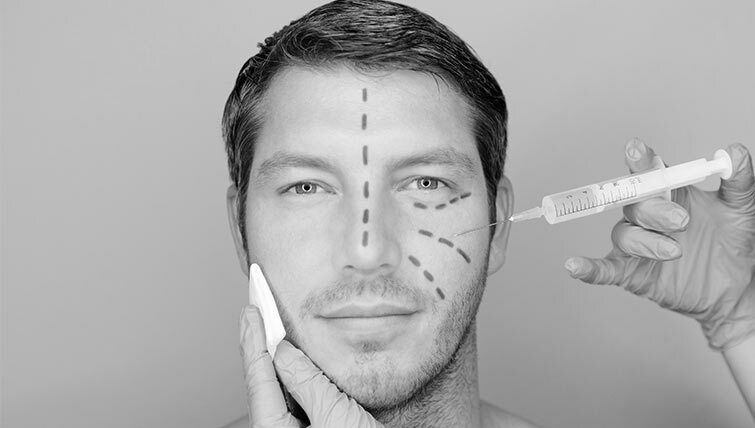 Anti-wrinkle injection today is a part of virtually every aesthetic treatment plan in a busy aesthetic practice. In India as well there is an obvious trend towards increased awareness, overall acceptance and willingness to go in for a treatment which in the past has been plagued by misconceptions and myths popularized by the media. Contrary to what is believed that neurotoxin injections lead to a frozen, unnatural expression and weird shape of the eyebrows, if done by a skilled professional, in the right manner and in appropriate doses there are no chances of such outcomes. Neurotoxin injections are proven to smoothen out wrinkles, contour the face, reduce fine lines and provide a softer, brighter, rested and attractive appearance to your skin. The problem areas which are commonly treated by anti-wrinkle injections are frown lines, forehead lines, crow’s feet around the eyes, mouth lines, jawline and lines on the neck. These are exotoxins synthesized, processed and used to inhibit the release of acetyl choline (Ach) at the neuromuscular junction (the connection between the nerve and muscle) thereby leading to temporary muscle weakness and decrease in the lines on the face. Essentially the lines or wrinkles in the face occur due to the pull of the underlying muscles on the overlying skin – The muscles of the face are attached to the skin as they help is expressing ourselves (“Facial Mimetic” muscles). For example, when we raise are eyebrows in surprise there are horizontal lines on the forehead due to the contraction of the underlying frontalis muscle which is attached to the overlying forehead skin. Once the neurotoxin is administered to this frontalis muscle the lines on the forehead diminish or are softened. 1. Safe treatment – It is probably one of the most studied and explored aesthetic treatment worldwide with ample data supporting its safe use. These injections have no long-term side effects or health hazards. However, it is necessary that they are injected in a proper manner under the guidance of an experienced and skilled dermatologist so that the chances of side effects and severity will be low. 2. Minimal pain – Patients may feel little amount of pain during the procedure similar to an ant-bite and will be tolerable. 3. Rested and refreshed appearance – The neurotoxin has the potential to reduce wrinkles around and below the eyes, frown lines, horizontal forehead lines, the lines around the mouth and nose. Moreover, if used in a proper manner the neurotoxin also helps in reducing the “popply chin” appearance and contouring the chin and jawline. 4. Minimal downtime and side-effects – Patients may start their daily routine activities on the very same day after the procedure. They might face minimal side-effects such as redness, swelling, bruising etc. which typically settle within a few hours. As mentioned above anti-wrinkle injections work by inhibiting the communication between the nerve and the muscle (somewhat like they are gossiping less than usual). If this happens, the muscle contraction is decreased to some extent and so is the pull on the skin and the subsequent wrinkle formation. Anti-wrinkle injections treatment work incredibly for candidates who are physically healthy, have no history of neuromuscular diseases, strong facial muscles. This treatment gives dramatic results if combined with the dermal fillers imparting freshness to the patient’s face. 1. How fast the result set in? Typically the effect of this injection takes anywhere between3-7 days completely kick in. The effect of the neurotoxin starts to wane of in 4 months or so. Further, if maintenance sittings are taken regularly the effect of toxin lasts for longer and also the dose required at subsequent sessions is lesser. 3. Will I get back my normal functions? I hope it won't look worse if I don't do it again? After intoxication of the neuron, with time nerve sprouting occurs and new neuromuscular junctions are formed. The neuron gets re innervated (starts talking to the muscle again) and returns back to full function. Anti-wrinkle injection administration does not result in substandard synapses post reinnervation of the neurons (no decreased functions or worse appearance once the effect wanes off). 4. I hope it won't look plastic and frozen? I don't want those raised eyebrows! Dr. Rajat urges his patients to visit a skilled and trained doctor whenever considering such treatments. At Veya Aesthetics, we respect our patients’ goals and it is our endeavour always to retain the innocence and grace of the face and not make it look “plastic”.